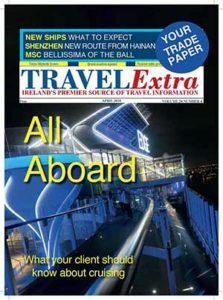 You are at:Home»Sunday Supplement»2019 Sunday Supplement archive»TRAVEL Extra’s Sunday Supplement: Pier pressure, is Dublin Port willing to reprieve its cap on cruise ships? Garuda cancels order for Max, who is next? Is Jet Airways a dead airline flying? A skier who was waiting to descend an off-piste ski route in the Austrian Alps had a ridge of snow give way beneath him at St Anton am Arlberg. Watch here. Want the best explanation of the issues raised by the Boeing Max debacle? Watch here Juan Browne’s YouTube Video from November last. On the week of the the interconnected spring equinox, St. Patrick’s Day, and the final super moon of 2019, watch here a speeded up version of the Cairn T equinox alignment at Loughcrew. Sadly the cairn is closed due to structural damage until further notice. 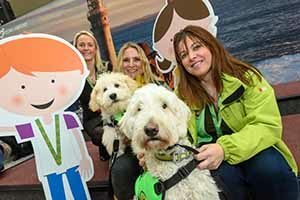 The biggest travel trade event ever in Ireland took place at the RDS Main Hall on Thursday where 130 suppliers, fifty of them new exhibitors, turned out to meet 245 key travel trade at the Irish Travel Trade Show. The attendance included CEOs of Irish travel agencies and chains that exceeded turnover of €400m. 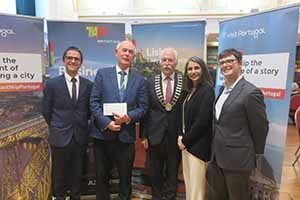 Picture shows Fernando Pires of Alentejo Tourism, prize winner Richard Cullen of Killiney Travel, John Spollen of Cassidy Travel President of the ITAA, Susana Cardoso Director of Portuguese Tourism office in Dublin and Carlos Oliveira of TAP, who showcased their new twice daily Lisbon service, due to start March 31, to the trade at the event. Speaking to Travel Extra, Carlos said 30pc of the bookings on the route were onward connections, and TAP expects that figure to grow in the coming months with the service to Azores, Capo Verde and Brazil especially attractive. See more pictures here or connect with the album on Facebook. Dublin Port’s message to the international cruise industry has become increasingly baffling. 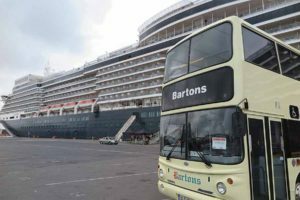 Two years after winning the long battle to secure home port mini season status from first Celebrity and then Princess, the port has backpedalled on cruise calls and put a cap of 80 on the number of cruise calls to the city starting in 2021. In a further withdrawal from cruise promotion, the city will not be represented at Seatrade in Miami in two week’s time, when the cruise world gathers to make decisions. What initially appeared to be a public pitch to achieve €120m funding for a North Wall extension, currently not affordable from the port’s €2m a year cruise ship income, could turn into a reversal of twenty years of progress in establishing Dublin on cruise ship itineraries (and as Simon Coveney pointed out, by extension, Belfast, Cork and others ports). The reaction from CLIA is a first indication of how fickle decision-making by major cruise lines can be. There are two key cruise berths, berth 18 and berth 33 and 12 optional places on John Rogerson’s quay, and these are the spots capped at 80 calls by Dublin Port to avoid interfering with the ship’s ro-ro facilities. The proposed €120m North Wall extension would be able to berth two 350m cruise ships, basically everything on water up to Royal Caribbean’s Oasis Class. Cruise companies are likely to help pay for the facility if offered the right terms. Each turnaround for a home ported ship averages three bed nights in the city and generates €1m, and celebrity were on the point of committing to home porting for a full season from 2021 to 2025, rather than a mini season. Other cruise lines are also putting their 170,000 ton toes in the water. It is a fine time for Ireland’s cruise industry to up anchor and away. After the histrionics, the money for the pier extension may yet be forthcoming, but will there be any cruise companies willing to call? 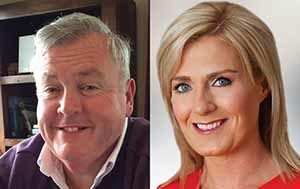 For more on the subject, Travel Extra‘s Eoghan Corry will be on the RTE1 Marian Finucane show this morning, Sunday March 24. It landed late, like one of those legacy airlines that never seems to care for their customers, but there was little to indicate what caused the delay in the 51 pages of the Department for Transport statutory instrument to implement the EU Package Holiday Directive. As Shane Ross insisted, many of the provisions are already in place in existing legislation, including the notations that allow tour operators from elsewhere in Europe to trade in ireland. Ireland is the last of the 27 EU countries to implement the legislation. Under the new rules airlines and websites which offer accommodation, transfers or other services linked to an air fare are now subject to the same rules as travel agents, and agents and tour operators registerd in one EU country can trade throughout the union. The April 2019 print edition of Travel Extra wlil be arriving in agencies in the coming days. We preview the cruise season in the month’s edition. See here. Jet Airways India, once India’s second-biggest airline, is flying just about a third of its fleet because its inability to pay lessors is grounding aircraft. The company has 41 planes available, according to a statement released by the Directorate General of Civil Aviation after it reviewed Jet Air’s performance in New Delhi Tuesday. The beleaguered airline, which has a fleet of 119 as per its website, has been forced to ground planes as it awaits restructuring of its debt. The Indian government has asked state-run banks to step in and save Jet Airlines by swapping debt for equity. Etihad asked State Bank of India to buy its 24pc stake in Jet Airways (India), seeking a total of US$58.3m. Etihad has also offered to sell its 50.1pc stake in Jet Privilege to SBI and other lenders. Update on flight cancellations and groundings here. The closure of Pakistani air space is affecting 400 flights daily with Air India worst-hit of the airlines due to this closure. Airspace was closed a day after India launched airstrikes on a Jaish-e-Mohammed terror camp in Balakot, Khyber Pakhtunkhwa province. Air India flight between Mumbai and New York, launched in December 2018, has also been suspended and has been combined with the Mumbai-Newark-Mumbai flight from 16 March to 31 May 2019. Insurance costs and Brexit exercised the minds of the Irish Travel Agents Association AGM at the RDS prior to the Irish travel trade Show on Thursday. Insurance premiums in some cases have risen and the ITAA has joined the Insurance Action Alliance to lobby on the issue. Travel advisors report a hesitation in bookings as prospective holidaymakers await a formal political agreement on Brexit. Rendez Vous en France, the annual French inbound tourism event was hosted by Marseilles this year, where concern was expressed about France’s image amid gilets jaunes protests that saw the destruction of the iconic Le Fouquet’s in Paris just as the event was about to begin. 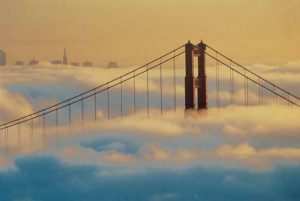 As a chilly mistral engulfed the city, it hosted 788 French exhibitors and 950 tour operators from 73 countries. The MUCEM, architect Rudy Ricciotti’s landmark museum on the Old Port, its lace-like metallic facade illuminated in blue light, was the venue for the opening event. One of France’s 27 three star Michelin chefs, Gérald Passédat helped launch MPG 2019, “A Gastronomic Year in Provence,” which will feature 1,000 events, including celebrity chef workshops. François Navarro described how Lille “lives and breathes culture” and will host the €8m Elodrado festival from April 27. The 15th addition of Rendez-vous en France will be held in Nantes on March 24-25, 2020. France received a record 90m visitors in 2018 and Atout France said tourism is the biggest economic activity in France, generating the most employment, generating €167.8bn in earnings and 7.1pc of GDP. 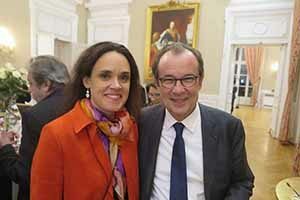 Picture shows Gwenaelle Delos, Director of French Tourism office in London and Christian Mantei, CEO of France’s tourism development organisation Atout France at an event in the Palais du Pharo to mark Rendez Vous en France. See more pictures here or connect with the album on Facebook. Hautes-Alpes region in France hosted key travel trade from around the world in advance of Rendez Vous de France for a “ski and sea” famil. 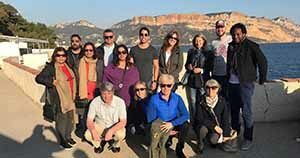 Picture shows the group Group in Cassis on front of Le Cap Canaille, Madhuri Kanga of Ahura Travels Mumbai, Hutokshi Marker of Trail Blazer Tours Mumbai, Manish Kripalani of Baywatch Travels Chennai, Tina Kanuga of Bathija Travels Mumbai, Sashko Donchovski of Atlantis Travel Macedonia, Andres Serrano of Contiviajes Ecuador, Anne Courcier of Snowventures Sedona USA, Michelle Vallet of Cassis Tourism, Anton Ikannikov of KMP Travel Russia, Maxime Yehouetome of Klook Travel Netherlands (front): Eoghan Corry editor of Travel Extra Ireland, Isabel Nicolas of Hautes-Alpes Tourism, Illya Gorshkov of Alp Discovery Russia and Helene Muller tour guide. See more pictures here or connect with the album on Facebook. Travel media were hosted in Les Goudes in advance of the event. For more images from our galleries. See more pictures here or connect with the album on Facebook. 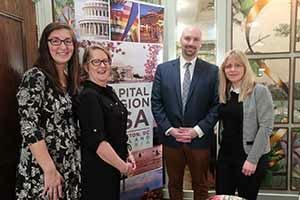 The USA Capital region highlighted upcoming events at a breakfast event for the trade in the Ivy Rooms, Dublin. Picture shows Leslie Troy, PR Manager of Maryland Dept. of Commerce, Christi Braginton, International Media Relations Manager of Virginia Tourism Corp., Scott Balyo,, Executive Director of Capital Region USA and Beth Higham, PR Director of Capital Region USA. See more pictures here or connect with the album on Facebook. 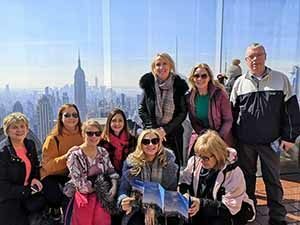 Globe Hotels and United Airlines hosted prize winners on a three day fam trip to New York. Picture shows the group at Top of The Rock: Martina Greene of East West Travel, Nicola Churchill of Best4travel, Caroline Martin of Dempsey Travel, Janice Barron of O’Leary Travel Julie Farmer of O’Hanrahan Travel, Ger Dinan of Douglas Travel, Dympna Crowley of Lee Travel, Linda McNamara of Ace Travel and Gerald Rowland of Kilkelly Travel. The group visited the 9/11 Memorial Museum, Top of the Rock, took a boat trip along the Hudson, visited the Irish Hunger Memorial, went for a stroll in Battery Park, toured around the city on the Hop on Hop off Red Bus and managed to fit in a bit of retail therapy too in Macys and Bloomingdales. The winners were escorted by Jeff Collins MD of Globe Hotels and Audrey Headon, Headon Representation who represents Globe Hotels. See more pictures here or connect with the album on Facebook. 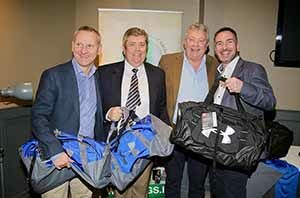 Travel Industry Golf Society team event at St Margarets, the first fo the season was won by Darach Culligan, Martin Callanan and Bryan Wallace with runner up award to Dermot Merrigan, Peter O’Hanlon, Mark Reddy and Volker Lorenz (pictured) and Tanya Airey, Philip Airey, Gillian Lowry and David Smith placed third. Vice captain Olwen McKinney celebrated her birthday at the event. See more pictures here or connect with the album on Facebook. Prizes at the Etihad Airways and Abu Dhabi roadshow next week March 27 in Belfast and March 28 in Dublin will be 2 x 2 return flights to Abu Dhabi in economy, Rixos Saadiyat – 2 x 3 nights prize all-inclusive board, Rotana 1 x 3 nights Saadiyat Rotana, 1 x 2 nights at Khalidiya Palace 2 adults with breakfast Yas themepark – 2 x 3-park passes for winner + partner, to go with one of the hotel prizes, Jumeirah – 1 x 4 nights B&B (Saadiyat 2 nights + Al Wathba 2 nights)(Dublin event only). TUI entertained key travel trade at a mystery event at the Marker Hotel and afterwards at Windmill Lane. 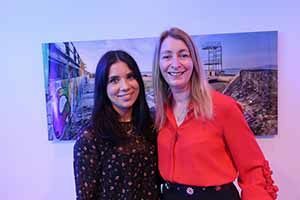 Picture shows Alexandra ‘Sandy’ Stybaniewicz of TUI and Lisa Tuckman of Seaside Hotels, who co-hosted the event. See more pictures here or connect with the album on Facebook. Topflight’s Many Sides of Italy cinema advert narrated by BAFTA award winner and Sherlock criminal mastermind Andrew Scott, will run for the next month in cinemas across the country where world-famous Italian destinations and the senses which surround them are brought to life. Skal Ireland National AGM will be held on Friday 5th April at 2pm in the Ashling Hotel, Dublin. For more images from our galleries See more pictures here or connect with the album on Facebook. 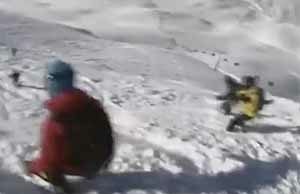 An unnamed Edinburgh snowboarder who became disorientated in a blizzard at 3,500ft on Cairngorm survived by cuddling his dog for warmth as they waited to be rescued. Mark DeAngelis from Londonderry New Hampshire man celebrated his wedding anniversary by showing up at the airport in a bunny costume similar to the one used when he first proposed to his wife. Amsterdam is banning tours of its Red Light District as part of an ongoing effort to address tourist congestion: 1,000 guided tour groups pass through Oudekerksplein, the Red Light District’s main square. 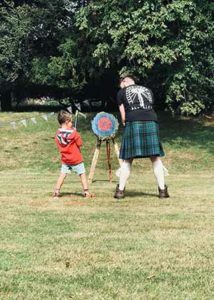 Scone Palace to host Scottish Axe Throwing Open for first time. Eurostar advised passengers not to travel to Paris unless absolutely necessary for the rest of the month. Disneyland Paris new visual featuring Marvel Super Heroes commences this weekend and continues until 16 June, 2019 at the Walt Disney Studios Park . Orlando International Airport sued the much smaller Orlando Melbourne International Airport on Florida’s Space Coast, claiming its name was misleading passengers. Huntsville, Alabama, plans to commemorate the Apollo 11 anniversary events include an Apollo Homecoming Dinner at the U. S. Space & Rocket Center, a Celebration Car Show, and a concert on July 20th, moon landing day. Legoland California turned twenty with a suite of celebratory events. New walking and cycling routes will be launched in the Algarve this May. Spring break in USA, be prepared. Leon healthy eating fast food chain says its first Irish outlet in Dublin’s Temple Bar on Crown Alley, the former Eager Beaver clothes shop, will be the first of 20 restaurants nationwide by 2023, creating 600 new jobs. McDonald‘s appealed the decision to revoke the Big Mac trademark which came as a result of the Supermac’s case. Eddie Rocket‘s is planning to open new outlets in Galway, Limerick and Cork. A survey by the Donal O’Keeffe led Licensed Vintners Association showed 68pc of Dublin pubs expect business to grow in 2019 (21pc the same, 11pc expect a decline), 48pc expect growth in the region of 1pc to 10pc, 18pc expect growth of 11pc to 24pc and 2pc expect growth of 25pc, on contrast to survey results form hoteliers. the average Dublin pub expects to hire an additional five staff members during 2019 – two in full-time roles and three for part-time positions. Bill Dempsey is to purchase Dublin pub Davy Byrnes for €4.5m. Underwater restaurant Under opened in Norway, offering 18-course meals based on local ingredients and seafood, can cost up to 3,700 crowns per person including drinks. 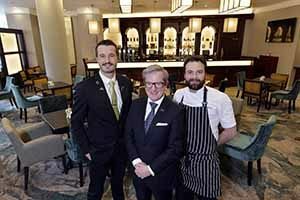 Picture shows James McGinn, General Manager of the Europa Hotel joined by Taylor Kirk, Bars Manager and Kyle Greer, Executive Head Chef announcing the completion of a £500k renovation programme, the Lobby Bar has been transformed and the Piano Restaurant fitted with new banquette seating to increase the capacity of the Piano Lounge by 120 while the Grand Ballroom has been modernised to include mirrored panelling. Trivago named the winners of their provincial hotel awards in five, four and three star and alternative accommodation categories: Connacht: Ashford Castle, Strandhill Lodge, Riverside Sligo, and Jameson Court Galway. Leinster: Merrion Hotel, Croke Park hotel, Lawlor’s Naas and Avlon House Carlow. Munster: Killarney Park, Lough Lein, Killeen House and Ballybunion B&B. Ulster (two awards): Lough Eske & Merchant Belfast, Farnham Estate & Tara Lodge Belfast, Ballyliffin Townhouse & Balyrobin Country Lodge Crumlin and Malinbeg Hostel & Pinetrees B&B Ballymoney. Galmont, Hilton Garden Inn, River Lee, Radisson Blu Letterkenny and Park Inn Belfast won provincial awards for best online presence and Radisson Blu Sligo, Metro Dubin Airport, George Limerick, Radisson Blu Letterkenny and TAP Belfast won awards for direct bookings. Picture shows Niall Rochford and Paula Carroll of Ashford Castle. STRGlobal reported Dublin hotel occupancy was down 1pc in February and RevPAR down 1.6pc, regional occupancy is up 1.3pc and RevPAR up 3.5pc. O’Callaghan hotel group was granted permission to proceed with the development of a new eight-storey 158-bedroom hotel on Dublin’s Cumberland Street. Jurys Inn and Leonardo Hotels said all five of their hotels in Ireland have received four-star AA accreditation. Best Western acquired WorldHotels 300 hotels and resorts, vowing to protect the brand’s separate identity. Marriott International Inc has said that it plans to open more than 1,700 hotels and return up to $11 billion to shareholders by 2021 as part of its three-year growth strategy. READ TRAVEL Extra's Sunday Supplement: Life after A350, FOUR of Aer Lingus 350s to go to Iberia but what about the other five? Aer Lingus has dropped Dublin-Murcia and Dublin-Stuttgart from the summer 2019 programme. 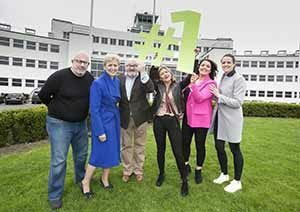 Dubin airport‘s spring round of route launches commences March 31, with Air Baltic’s new route to Riga, TAP to Lisbon and Ryanair to Bournemouth. 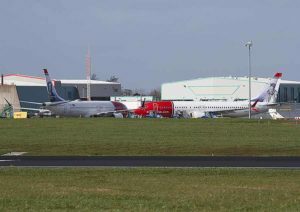 Norwegian‘s summer Cork to Providence service is closed for bookings while the airline seeks a n alternative aircraft to the Boeing 737MAX. Norwegian’s contingency plan should this fail and the Max still be grounded is to bus Cork passengers to Dubin for the daily B787-9 Dreamliner service, (currently scheduled until April 30 subject to Max becoming available) for the Dublin-New York Stewart daily flight, followed by a three hour bus journey to Providence. 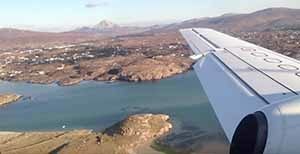 Donegal Airport was named most scenic landing in the world by private jet booking service PrivateFly for the second year in a row. Watch here. Cork Airport is to open two new facilities in Cork Airport’s main terminal, the state-of-the-art office space and airport control centre, at an event tomorrow morning. Matthew Thomas is to step down as CEO of Shannon Group after four years to take up the same position at the Ports of Jersey. Mary Considine becomes acting CEO for the second time in her career. Kerry Airport’s new General Manager, Waterville native John Mulhern took over from the recently-retired Peter Moore. Aer Lingus’ partnership with the Qantas frequent flyer programme will end on July 1, the option of using Qantas Points with British Airways remains on flights to Dublin. CEO Andreas Gruber said Ryanair-owned Laudamotion will delete the word “motion” from its name for marketing reasons as Lauda increases its fleet in Vienna by 3 to 11 aeroplanes in the autumn and to 14 in summer 2020 with four bases, Dusseldorf, Palma, Stuttgart and Vienna and a fifth base outside the German-speaking area. 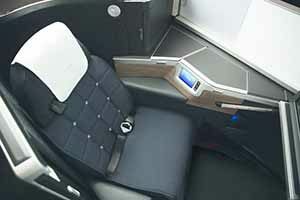 British Airways new business class product Club Suite (‘the suite with a door’) will feature on its first A350 due for delivery July, with B777s and B787s to follow, offering “your own personal space to sit, sleep, work, or relax” isolated by a sliding screen,” manufactured in Co Antrim and customised by British Airways’ in-house design team. Munster MEP Deirdre Clune contended that Shannon should qualify for grant-aid under a rule which allows subsidies to airports with less than 3m passengers. 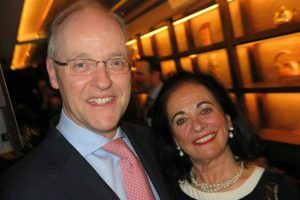 Strabane -born EasyJet chief operating officer Chris Browne has taken early retirement due to her husband’s ill health. Dublin Airport’s Twitter account won The Moodie Award for the best Airport Twitter account for the fourth time in six years. Picture shows Neil Hayes, Siobhán O’Donnell, Paul O’Kane, Ciara Carroll, Audrey O’Hagan and Sinéad O’Donnell. Babcock International is to open a helicopter base facility at Kerry Airport in Farranfore to service oil and gas exploration operations off the west coast. Avolon closed its inaugural US$500m three year unsecured term loan facility, which was oversubscribed and upsized by 60pc based on the original launch size of US$300m and received investment from a group of 13 international banks from across Asia, Europe and the United States. Nordic Aviation Capital completed its third senior unsecured private placement issuance, launched at US$250m and oversubscribed to US$786.25m, the largest US private placement by an aircraft leasing company. Orix Aviation aims to grow its fleet to 300-400 from about a current 233, with 320 aircraft by March 2021 and expects to hit its US$2.5bn acquisition target in the next financial year. Virgin Atlantic will fly daily B787 between London Heathrow and Sao Paulo from 2020, its first foray into South America. The renovated 2,004-passenger Norwegian Sky emerged from a three-week dry dock in Freeport, Bahamas, with refreshed cabins, updated public spaces and eight new drinking and dining venues, including new-to-the-fleet Pinnacle Lounge and Sushi Bar, pub-style The Local Bar & Grill; Italian restaurant La Cucina,; Sugarcane Mojito Bar; poolside-venue Topsiders, Bliss Ultra Lounge, Spinnaker Lounge and Starbucks. Existing free-dining Palace restaurant, Crossings main dining rooms, Garden Cafe and The Great Outdoors as well as for-fee restaurants Cagney’s and Le Bistro have also received makeovers. 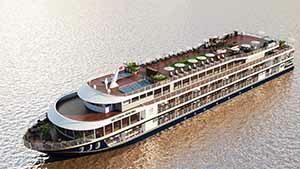 Uniworld released renderings of their new Mekong ship. Royal Caribbean Oasis Lagoon, features a sloped entry for easy access and a swim-up bar, at their private resort at Perfect Day at CocoCay (formerly CocoCay) in the Bahamas. Regent Seven Seas revealed the luxury design for cabins on Seven Seas Splendour with a luxurious yet comfortable design similar to those on sister ship Seven Seas Explorer. Carnival ships will offer beer brewed at sea through a collaboration with Brew Hu in Lakeland, Florida. P&O’s new ship Iona will hold Strictly Come Dancing on Summer 2020 sailings at The Limelight Club. Oz Clarke, Will Lyons and Charles Metcalfe are set to headline Cunard‘s “Voyage du Vin” wine-themed sailing onboard Cunard Queen Victoria in September 2019. SeaDream Yacht Club’s first new build, SeaDream Innovation, to launchSeptember 2021, will visit 200 ports in 49 countries during its first year. Wicklow is to become the 10th destination worldwide to host the prestigious international Eco Trails nature race, which will take participants on Saturday 28th September across a selection of challenging routes; 17km, 28km, 42km and 80km visiting sites such as Powerscourt Waterfall, Ireland’s highest at 121m, starting and finishing on Bray Seafront. 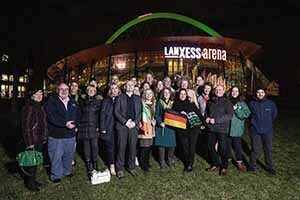 Representatives of 25 tourism businesses from Mayo, Galway, Roscommon, Leitrim, Sligo and Donegal with with Finola O’Mahony, Tourism Ireland (front, sixth right); and Donal Healy, Ireland West Airport Knock (front, fifth left), met 70 German travel agents at a St Patrick’s Day business networking event in Cologne Bonn Airport to promote the new Cologne to Knock flight to begin June. A tourist’s €50 will run out at 3:00 pm in Dublin, according to alpharooms Ireland, compared with 12:30 pm, a similar 3pc in Rome, and Vienna and all day in In Istanbul, Prague and Antalya, and you will still have money left over. See here. The Cool Planet Experience, Powerscourt, Co Wicklow, (website) has been nominated for European Museum of the Year. 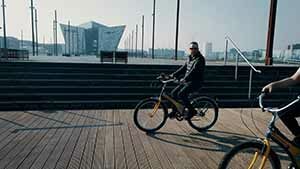 Neil Delamere embarked on a road trip to Belfast, the Causeway Coastal Route and the Walled City of Derry with TravelNI offering travel itineraries for those inspired by Neil’s trip and released research showing Belfast-born Hollywood actor Jamie Dornan is the most-desired Northern Ireland (NI) celebrity to make road trip memories with. Kylemore Abbey building is closed for renovations until mid-April. All other areas remain open. Editor of Astronomy Ireland magazine, David Moore, said that there is a “good chance” that the lights will be visible over Ireland. Lismore Castle Devonshire Day takes place on March 31st. 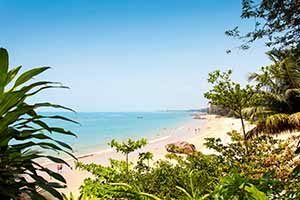 TUI offers: Dublin to Thailand, Khao Lak Bhandari & Spa, Khao Lak, 3*+, BB, 7 nights from €1,049pps. Depart 2nd May 2019. Dominican Republic AI from €1,249pps Dublin to Dominican Republic, Caribe Club Princess, Bavaro, Punta Cana, 3*, AI, 7 nights from €1,049pps. Departs 14th May 2019. Get some last-minute sun from €319pps: Dublin to Tenerife, Las Piramides Resort, Playa de Las Americas, 3*, SC, 7 nights from €399pps. Departs 5th April 2019. Dublin to Lanzarote, Lanzarote Paradise Club, Costa Teguise, 3*, SC, 7 nights from €319pp. Departs 7th April 2019. Dublin to Gran Canaria, Portonovo Apartments, Puerto Rico, 3*, SC, 7 nights from €619pps. Departs 18th April 2019. Dublin to Tenerife, Las Piramides Resort, Playa Las Americas, 2*, SC, 7 nights from €629pps. Departs 19th April 2019. Dublin to Lanzarote, Tabaiba Apartments, Costa Teguise, 3*, SC, 14 nights from €499pps. Departs 21st April 2019. Direct to Mexico for 2 weeks All Inclusive from €1,319pps: Dublin to Cancun, Grand Bahia Principe Coba, Riviera Maya, 4*, AI, 14 nights from €1,319pps. Departs 10th June 2019. 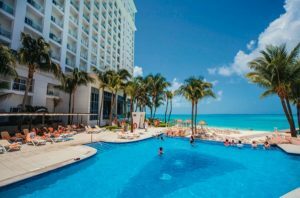 Dublin to Cancun, RIU Tequila, PlayaCar, 3*, AI, 14 nights from €1,319pps. Summer 19. Departs 17th June 2019. Dublin to Paphos, Hotel Helios Bay, Paphos, 3*, SC, 7 nights from €349pps. Departs 15th May 2019. Dublin to Majorca, Hotel Lagotel, Playa De Muro, 3*, SC, 7 nights from €339pps. Departs 21st May 2019. Dublin to Ibiza, Hotel Brisa, San Antonio, 3*, RO, 7 nights from €369pp. Departs 22nd May 2019.Shannon to Lanzarote, Lanzarote Paradise Club, Costa Teguise, 2*, SC, 7 nights from €379pps. Departs 16th May 2019. Cork to Costa Dorada, Hotel Cala Font, Cap de Salou, 3*, HB, 7 nights from €439pps. Departs 21st May 2019. Ireland West to Majorca, Mariners Club, Alcudia, 3*, SC, 7 nights from €489pps. Cruise: Marella Dream – Treasures of the Mediterranean from €899pps. Departs 20th June 2019. Cork to Majorca, Marella Dream – Treasures of the Mediterranean, inside cabin, AI, 7 nights from €899pps. Departs 7th May 2019. For the latest Mexico offers visit https://www.tuiholidays.ie/. To Book: Visit https://www.tuiholidays.ie Call 1850 45 35 45 or visit a TUI Store /travel agent. Sunway Offers:‘ Jewels of Italy, from €1,289pp. Price includes flights ex Dublin, 20kg bag per person, taxes, 6 nights twin share3*hotels,scheduled airport transfer, some meals and tours as per itinerary.Subject to availability and change. Departs 20th October 2019. Sunway River Cruise: 5* Melodies of the Danube’ fly to Budapest and home from Munich. From €2640pp. Includes flight ex Dublin, return port transfers, 7 nights twin share in an outside stateroom, unlimited wine/beers at meals, sip and sail daily cocktail hour & daily complimentary excursions. Not included gratuities and port charges of €150pp. Includes early booking reduction of €850pp. Subject to availability and change. Departs Dublin 7th July 2019. Sunway Club Med: Club Med All Inclusive Cefalu, Sicly 5T. Adults from €1,875pp. Price includes flights ex Dublin, 20kg bag per person, resort transfer, superior room twin share, activities,all -inclusive for 7 nights.Includes early booking discount of €654.00.Subject to availability and change. Departs 4th May, 21st June 2019. Sunway Adventure Holiday: Japan Express Adventure’. Fly to Osaka and return from Tokyo. From €3035pp. Includes flight ex Dublin, 20kg baggage per person, 8 night’s accommodation on twin share basis, some meals andtours as per itinerary. Price includes offer of €354pp, tour must be booked by 31st March. Subject to availability and change. Departs 28th June 2019 Sunway Summer/WinterHolidays: Kusadasi – 4* Golden Day Wings Hotel. Bed & Breakfast Basis. 14 Nights. From €399pps. Departs 13th April 2019. Algarve – 3*+Paraiso Apartments. Self Catering Basis. 7 nights from: €349pp. Departs 4th May 2019. Lanzarote – 2* OasisApartments. Self Catering Basis. 7 from: €499pp. Departs 11th May 2019. Sicily – 2* Miostosis Apartments. Self Catering Basis. 7 Night from: €459pp Departs 18th May 2019. Fuerteventura – 3* Oasis Dunas Apartments. Self Catering Basis. 7 Nights from: €369pp Departs 4th May 2019 Sunway worldwide: Special Business Class Offer. Dubai Business Class return flights Ex Dublin with Emirates to Dubai. 3 Nights at the 5 star Le Meridien Mina Seyhai Hotel. 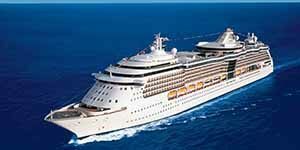 B&B basis from €3569pp Sunway Cruise: Cape Town to Southampton Fly Cruise. Queen Victoria.16 Nights. Sailing from Cape Town, South Africa. Flights from London to Southampton Included. All baggage and transfers included. From €1699pp. Departs 11th April 2019. Western Med Fly Cruise: MSC Seaview 7 Nights. Sailing from Barcelona. From €1099pp. Departs 26th October 2019 Eastern Med Fly Cruise: Norwegian Spirit. 7 Nights. Sailing from Rome. Premium All Inclusive Included. From €1195pp. Departs 15th December 2019. 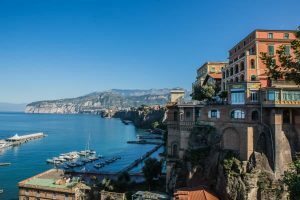 Spain & Italy Fly Cruise: Oasis of the Séas. 7 nights. Sailing from Barcelona. From €1029pp. Departs 5th May 2019. Italy & France Fly Cruise: Oasis of the Seas. 7 Nights. Sailing from Barcelona. From €1029pp. Departs 5th May 2019. www.sunway.ie.